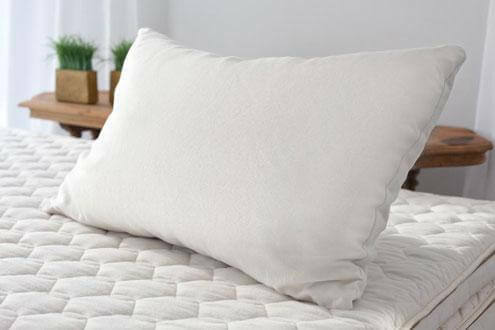 The Savvy Rest Organic wool pillow is the ultimate in feel because you can customize the feel and support for the firmness you desire. The fill is a 50-50 blend of organic wool fiber and organic wool “bolus” (pron. BO-luss), sourced from the same supplier who provides our casing’s wool batting. Wool bolus is composed of little balls of wool that are lighter and less prone to compact than ordinary wool batting. Like our shredded latex pillows, the new Savvy Rest wool pillow can be customized for each individual. It comes overstuffed. You can unzip the outer casing and remove fill to personalize your pillow for perfect support comfort, and feel . Shop our entire pillow selection now!